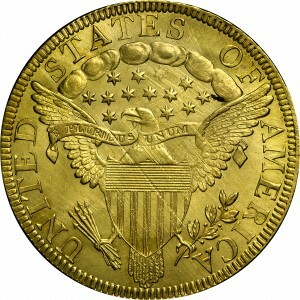 Two varieties of 1798 eagles, both overdates, are from distinctly different obverse dies. While the single obverse die for 1797 Heraldic Eagle coinage had 16 stars, both unused 1797 obverse dies, overdated in 1798, had just 13 stars. 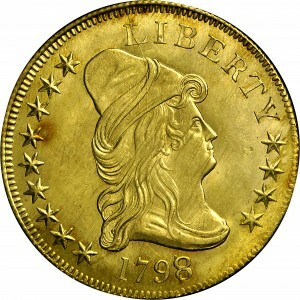 Both obverse dies are married to the same reverse that was previously used in 1797. This die marriage is not as rare as the other 1798/7 variety, although it is quite scarce, with only about 80 examples known. This Bass Collection coin, formerly from the Garrett Collection, is one of the finest known. From the Bowers and Ruddy Galleries sale of the Garrett Collection, Part III, October 1980, Lot 1659. Previously from Harold P. Newlin, October 31, 1884. "Obverse: Stars 9+4. 8 punched over 7. Crack edge - L - cap - faintly thru hair to field opposite stars 3 and 4. Another crack, edge - upright of R - lower part of front hair coil. Another, from first crack to top of spit curl at ear - face - field beneath lower lip. Shield clash in cap. 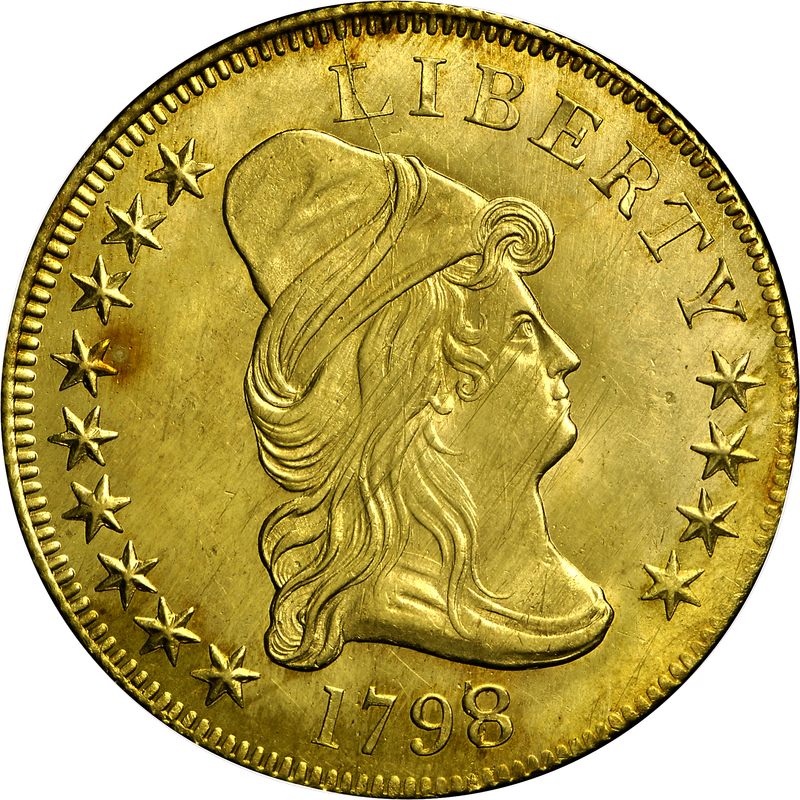 Reverse: That of 1797B. Heraldic eagle, short neck above motto (distinctive). Eagle has no tongue (distinctive). Die center punch circle on breast below U of motto (distinctive). Lowest arrowhead extends only to midpoint of left stand of N. Crack thru tops of UNITED."